Sauerkraut is made by a process of pickling called lacto-fermentation that is analogous to how traditional (not heat-treated) pickled cucumbers and kimchi are made. Fully cured sauerkraut keeps for several months in an airtight container stored at or below 15 °C (60 °F). Neither refrigeration nor pasteurization is required, although these treatments prolong storage life. Fermentation by lactobacilli is introduced naturally, as these air-borne bacteria culture on raw cabbage leaves where they grow. Yeasts also are present, and may yield soft sauerkraut of poor flavor when the fermentation temperature is too high. The fermentation process has three phases. In the first phase, anaerobic bacteria such as Klebsiella and Enterobacter lead the fermentation, and begin producing an acidic environment that favours later bacteria. The second phase starts as the acid levels become too high for many bacteria, and Leuconostoc mesenteroides and other Leuconostoc spp. take dominance. In the third phase, various Lactobacillus species, including L. brevis and L. plantarum, ferment any remaining sugars, further lowering the pH. There are unpasteurized sauerkrauts on the market. Properly cured sauerkraut is sufficiently acidic to prevent a favorable environment for the growth of Clostridium botulinum, the toxins of which cause botulism. Sauerkraut as immune booster, one of the not so secret benefits of sauerkraut is the boost it gives to immune systems. Packed with vitamins andminerals, sauerkraut has been used as a lay immune booster for centuries.Sauerkraut contains phytochemicals which are created during the fermentation process. These naturally occurring, beneficial by products of sauerkraut help boost the immune system which leads to a decrease in a number of health problems. The common cold, skin problems, weight gain and tainted blood are all fixed by a healthy functioning immune system. Sauerkraut as cancer fighter, The most recent evidence of sauerkraut's status as a Superfood is found in numerous studies on the cruciferous wonder's cancer fighting properties. The results of a study published in the Journal of Agricultural and Food Chemistry concluded that sauerkraut is a cancer inhibitor. The study discovered that the fermentation of cabbage produced a substance called isothiocynates, which prevents cancer growth, particularly in the breast, colon, lung and liver. Although raw cabbage is normally rich in a compound called glucosinolate, the researchers found that during the fermentation process enzymes are released that completely decompose the compound into several breakdown products. The majority of these products are cancer-fighting isothiocyanates. The University of New Mexico published a study linking sauerkraut consumption by adolescent females to a reduced risk for breast cancer earlier studies indicate sauerkraut may reduce the risk for other forms of cancer including lung, colon, prostate, and liver We are finding that fermented cabbage could be healthier than raw or cooked cabbage, especially for fighting cancer, says Eeva-Liisa Ryhanen, Ph.D., research manager of MTT Agrifood Research Finland, located in Jokioinen, Finland. A recent study by the American Center for Cancer Research has found that sauerkraut has a profound effect in preventing and healing breast cancer. Based on reports that breast cancer rates amongst polish women in the United States were much higher than those in Poland researchers set out to find out why. Their answer; the women who still lived in Poland ate significantly larger amounts of sauerkraut especially important while they were in adolescence. The research found that the women who immigrated Americanized' their diets and stopped eating as much of the super food that is sauerkraut thus increasing their rates of breast cancer. Digestive Aid, eating sauerkraut is a great way to protect the balance of bacteria in your gastrointestinal tract. Sauerkraut is one of the few foods that contain the bacterium Lactobacilli plantarum. L. planatarum is a very dominant strain of healthful bacteria which helps your digestive system in the following ways: boost the immune system by increasing antibodies that fight infectious disease help inhibit pathogenic organisms including E.coli, salmonella and unhealthy overgrowth of candida (yeast) create antioxidants (glutathione and superoxide dismustase) that scavenge free radicals which are a cancer precursor transforms hard-to-digest lactose from milk to the more easily digested lactic acid. It neutralizes the antinutrients found in many foods including the phytic acid found in all grains and the trypsin-inhibitors in soy generates new nutrients including omega-3 fatty acids, digestive aids and the trace mineral GTF chromium. These various properties are the best scientific reasons given for what has been known by loyal users for millennia, sauerkraut cures an upset stomach and is the best natural physic there is. Many sources say raw fermented foods are beneficial to the digestive system by increasing the healthy flora in the intestinal tract or creating the type of environment for them to flourish. Sauerkraut and its juice are traditional folk remedies for constipation. Fermentation actually increases nutrient values in the cabbage, especially vitamin C. Fermented foods are also said to facilitate the breakdown and assimilation of proteins. They have a soothing effect on the nervous system. The benefits of sauerkraut and sauerkraut juice have been recognized for generations. In some families of southern Germany, the children are fed raw sauerkraut twice weekly to support their intestines. Today it is thought that these benefits may relate to a high proportion of lactic acid in sauerkraut and sauerkraut juice that naturally supports the digestive processes, maintain intestinal flora, and increase the feeling of well-being. Flu Fighter, with the spread of Avian Flu spreading across the globe, one enterprising Korean scientist, Kang Sa-Ouk of Seoul National University, took 13 chickens infected with avian flu virus and a couple of other diseases, fed them Kim chi extract and found that 11 of the birds recovered. Experts think the vital bacteria are created during the fermenting process and this gives the dish its health-boosting qualities. Heat skillet over medium heat. Add sauerkraut, chicken stock, mustard, salt and pepper, simmer about 10 minutes. Cut kielbasa in half and then cut sausage lengthwise, opening them up. In separate skillet, add sausages and cook about 7 to 8 minutes, turning once. Wipe skillet before adding bread. Lightly butter 1 side of each slice of bread, butter side out. Add cheese, sauerkraut and turkey kielbasa. Place sandwich in skillet until crispy. Cut and serve. Enjoy! I have not tried sauerkraut before.I am wondering how this sandwich with turkey and sauerkraut would taste like. thanks for the great info and wonderful recipe! That looks so delicious! When I was in Texas, we went to a place that served slab bacon rueben sannies. WOW! I'd love one of those sandwiches now. What a neat way to make a Reuben, Christine! As much as I love corned beef, I also love the idea of mixing it up a little with kielbasa. I would love it if you was my personal chef. You know how to work the kitchen. Kielbasa and sauerkraut, awesome sandwich! super tasty looking. So much wonderful information, you are amazing. Thanks for sharing Christine! Thank you so much for all the wonderful comments. I have not heard of some of the ingredients and whether I am able to find it over at my place but it sure looks good and nice sharing. This sandwich looks so delicious and filling. I had no idea that sauerkraut had all of these health benefits. thanks for sharing! Have a great weekend! I have a ton of breakfast sausage! I love the Flu Fighters, they're the best!!!! This does look like a hearty sandwich- full of flavor. Turkey kielbasa is something I do need to try. Delicious-when is your deli open? I LOVE turkey sausage--this looks like a perfect weekend lunch to me. Thank you everyone! I hope y'all have a great weekend. This is a very informative post. I had heard that sauerkraut juice was supposed to be good for weight loss. 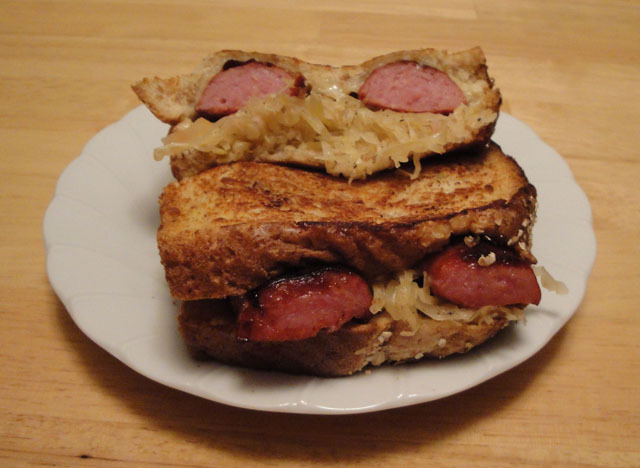 Kielbasa is in my grocery cart every week, will have to try this. Mmm!! This looks fantastic! I would never think to do turkey kielbasa but you know what, I bet its so super tasty. I have to try this! Sneak some kimchi in there next time.Yum!